Elaine Gantz Wright is a speaker, writer, and social media strategist, helping neighborhood businesses expand word-mouth-marketing exponentially–driving referrals, repeat business, and revenue. 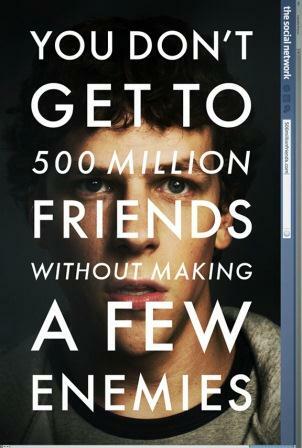 I saw The Social Network this weekend. The film was entertaining, but I think it lacked the depth and gravitas I expected— especially given the enormous impact of Facebook, the social media phenomenon that has quite literally changed the world. In the past six years, the world has learned to live out loud. But still, I feel the producers of The Social Network did not truly comprehend the intellectual significance of their subject matter—the social media revolution, itself. It’s more than the story of a business success and damaged relationships. It seems the anachronistic storytelling medium of film was not equipped to peel the social media onion with much precision. It captured the almost cliché concepts of narcissism and greed as they relate to success. What the film neglected was a deeper exploration a whole new way of interacting and being. I think the essential irony of the film — social misfit Zuckerberg’s inventing a whole new way of socializing was far more compelling than a seemingly endless stream depositions and legal puffery. I would love to have seen his parents and understood more about his family dynamic and his childhood relationships. I think his story is actually just scratching the surface. There will be so much more to Mark’s tale–past and present. The opening and closing scenes actually captured some of Zuckerberg’s pathos, but the rest of the film seemed pretty one-dimensional—simply documenting events and allegations. At his very core, Mark wanted to be part of something, to belong – to be loved. And isn’t that what we all want? Facebook fills a universal human need in an increasingly impersonal world. It’s so fascinating that Mark Zuckerberg’s naiveté and painful awkwardness gave birth to a communication revolution. I would even venture to say we could take that twist even further. As I studied the characterization in the film, I could not help by think of Asperger’s Syndrome, the autism-spectrum condition which causes difficulty processing information and relating to people. His off-the-charts intellect, arrogance, laser focus on Facebook, and his debilitating social insecurity seemed textbook. I have read that Albert Einstein and even Bill Gates have exhibited Asberger’s indicators. This just gives more credence to BubbleLife Media CEO Jeff Farris’ theory, “Nerds rule the world.” As Mark said of his creation, “We don’t know what it will be.” Those words apply to Facebook , his personal journey, and the burgeoning social media landscape. What did you think of the film? Of Zuckerberg? Social media? I found the movie entertaining, however it left me with a taste in my mouth of wanting to learn more about Mark since he has become such an iconic figure in the online ambiance. So, I hope we get another version which provides us the softer side of Facebook and how it has affected all of our relationship with our friends and inner circle. Evelio – I completely agree. Thanks for your perspective. Thank you for the post! I enjoyed reading about your insights into the movie. I haven’t had an opportunity to watch The Social Network yet, but I feel inspired to check it out and form my own modest opinion on the nature and degree of impact that this movie has left on the social media scene. What a significant opportunity for movie producers to continue to capitalize on the social media revolution! Very exciting! Now, enters a documentary called Catfish about Facebook, romance and a wee wild card. It provides just enough juice to justify the use of the term engaging: http://www.rottentomatoes.com/m/catfish/. I have seen Catfish and it portrays the use of social media as a vessel that serves certain human needs in a way that was unlikely prior to the dawn of web 2.0. It eagerly unveils a grab bag of needs and creates a context that stumbles upon a particular breed of social activity and human needs. Although movies have often contributed to inaccurate information concerning mental illnesses, Mary and Max may just be an exception: http://www.rottentomatoes.com/m/1209767-mary_and_max/. The movie is heavy, intense and an immensely beautiful film that involves a character that has Asperger’s syndrome and makes him loveable unlike a myriad of other movies that bastardize the face of those living with mental illness, such as bipolar disorders and schizophrenia. Let me know what you think after you see the SN film. Catfish is definitely next on my list. Thanks for your insightful comments. Loved your insights. I would like permission to share and post, Elaine. I am going to see the movie Thursday with other Nerds of the DFW Social Media “clik” and we shall see what the wisdom of that crowd shares. I understand there is a Q&A involved in this…all hail to the Nerds of Social Media. I feel I could have anticipated some of the movie’s mis-steps. I am anxious to view it now with “your eyes.” I look forward to comparing notes. Love dissecting movies with peeps. One of my favorite things…learn so much! Of course, wine must be included. Thanks again! Tamsen, thank you. Honored for you to share and post. So interesting to be living history! Thanks for your thoughtful comments — but “deeply as possible” is cursory at best. So much more truth to reveal. My most immediate response to THE SOCIAL NETWORK was that the film’s protagonist had Asperger’s Syndrome. I do not know the real Mark Zuckerberg, and I am not qualified in any way to analyze his motivations, but I am not aware of a single film review which mentions this as a possible explanation of the main character’s often brutal and pathetic actions and reactions. I am over fifty, and I do not use FACEBOOK because I still believe in the value of personal privacy. I often ask younger people about this issue, but I am usually met with blank stares. When I was in high school and college, every person whom I admired was being spied on by the local police, the FBI, the CIA or were actually on President Nixon’s enemies’ list. Has the rise of narcissism overwhelmed historical context and common sense? It was extremely interesting for me to read that post. Thanx for it. I like such themes and anything connected to them. I definitely want to read a bit more on that blog soon. It is rather interesting for me to read the blog. Thank author for it. I like such themes and everything connected to this matter. I definitely want to read more on that site soon.